This work is from Sidney Nolan’s Illuminations series which comprises 20 spray-painted images. The title of the work is drawn from a poem entitled, Adieu (Farewell), by the French writer, Arthur Rimbaud, who boldly declared that ‘one must be absolutely modern’ (il faut être absolument modern). Forever the innovator, Nolan embraced this motto and it became a guiding principle for him. This image is one of the most abstract and enigmatic works in the Illuminations series. 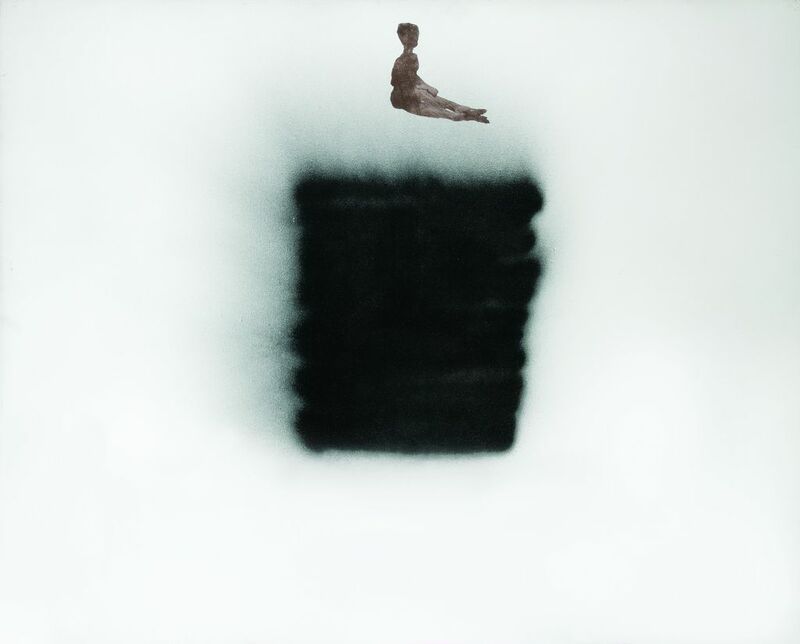 It depicts a small sepia toned seated figure hovering above a floating black square whose edges bleed into an expanse of white space. Pioneered by the Russian constructivist artist, Kazimir Malevich, the black square is emblematic of modern art and Nolan has used it in several works, most notably in the Kelly series where the artist re-fashions it to form Ned Kelly’s helmet.